Imagine a TV without a functional remote, or your child’s musical toy without sound. From grooming products to everyday utility items, to even Toys – we rely on batteries for a lot more than we acknowledge! A lot of everyday items run on power, often supplied by those mini powerplants we know as Duracell Batteries! I attended an event organized by Duracell last week. The panel at the event spoke about how Batteries are an everyday need. Duracell is also organizing a Durathon, a family running event, where families bond together while they participate in a fun marathon. 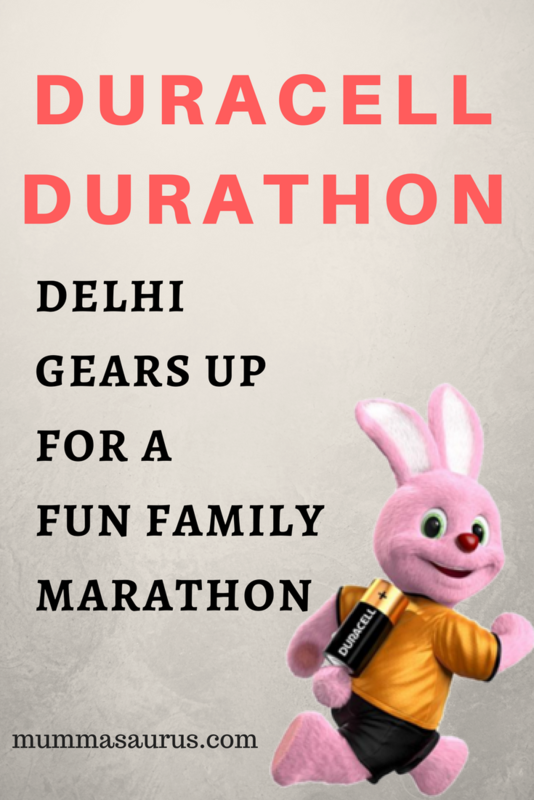 Let’s know more about the Duracell Durathon – a Family Marathon to be held in Delhi, this March! Duracell? Durathon? What’s the connection? Duracell is a brand that needs no introduction. The copper and black batteries are very common, in every household and we all pretty much rely on them, especially moms, whose happiness lies in watching their child play with their favorite toys. While living in Delhi, you often run out of fun things to do with family. Duracell Durathon is a perfect platform wherein the families can spend quality fun time by running together along with the iconic Duracell bunny. We as parents do understand how difficult it is to find an activity that is age-neutral, gender-neutral, and yet great fun. This is where Durathon comes to rescue! Durathon has been organized so that the entire family runs together. And by family, they not just mean Parents and children, but nieces, nephews, cousins, grandparents, aunts, uncles and the like can join in the fun – the more the merrier, isn’t it?! After a successful Duracell Durathon held in Mumbai in 2017, the Duracell Durathon has now come to Delhi. A panel of Mom bloggers was invited to attend the event and it was a delightful experience. It was interesting as well as pleasant to hear about some amazing facts and figures about Duracell, shared with us by David Abraham. Duracell has made appropriate changes in their Delhi edition of the Durathon vis-a-vis the one held in Mumbai. These changes ensure that the Duracell Durathon accommodates runners of all kinds – the enthusiastic ones and the athletic ones! Location: The 5 KM run would start from Central Park, Barakhamba Road to Mandi House, and back. Location: The 2 KM run will be a Full Circle run of the Central Park, Connaught Place. The numero Uno answer to this questions has to be “Quality Family Time”. It is also a great chance to test your physical strength and motivate yourself to reach a path of fitness! It has to start, wouldn’t you agree?! Along with prize distribution, there will be plenty of on-ground activities and goodies for the participants. Families can showcase their inner power, just like the Duracell Bunny. They can demonstrate how to go stronger for longer by finishing a 2 KM or 5 KM run along with their loved ones. Yet, the star component of the event shall continue to be Selfies with the Duracell Bunny, while wearing bunny ear headbands. I’m so sure my twinadoes are going to love these sweet memories for a long time to come! Then head on to the registration links shared above and book your entry tickets right away!! If you liked reading this article, give it a thumbs up and SHARE ahead! You may also like to read my views on how Global Indian International School, Noida is changing the face of education systems. Thanks for the details, and what fun loving marathon or we say duration. Wish I would lived in delhi. Would have come for sure. That seems like a great event Thanks to this article I am now aware of it and will keep a tab on their future events too. loved this concept of Family run, shall register for this run and join in for sure. Indeed great initiative by Durathon to bring family together and spend healthy time. Delhi people get your shoes on. For parents this is a great event to show their kids that staying fit is so important. Wow this marathon seems so interesting and fun way to stay healthy and fit. I would love to take part in the event. I so wish to attend such events that involves families to come together. I am sure you along with your twins are going to rock at this Durathon. I have registered for the duration. I am sure it’s going to be fun with family around. I can understand how excited the child must be to run alongside Duracell’s iconic battery. This was a great initiative by Duracell and running with family must be so much fun! Awesome event by Duracell .I wish to be Delhi ..
it must be fun day out with the family! I always love to be part of such events! This event by Duracell seems pretty interesting. Wish I had known about it’s Mumbai edition. But no worries, will await it’s next Mumbai edition and will try participating as well. looks interesting and fun! would love to do a fun & healthy activity with my family! amazing event by duracell , great i have never participated in a marathon maybe this time!!! Can’t wait to join the marathon in 2 weeks . Such a lovely post and im excited as well as looking forward to joining everyone .